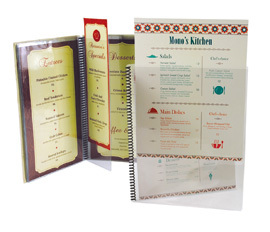 Spiral bound clear pages are versatile, and customizable, with a wide array of finishing options. To append your documents in spiral bound pages is attractive, affordable and easily customized for any application. Exchange your documents to update the presentation at a moments notice. Add print decoration to the cover page and to allow interaction with the inserted cover document. Depending on the materials and decorations applied to the covers this product can be refined to be a very high-end look and feel for impressions that last. The quality construction and materials are easily crafted for functionality and the impression of elegance. Choose from a wide variety of material stocks, size, and apply the finishing options that are perfect for your project.